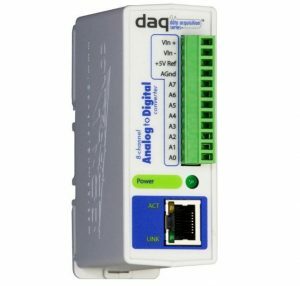 The X-332™ is a robust, full-featured, web-enabled Ethernet I/O module. 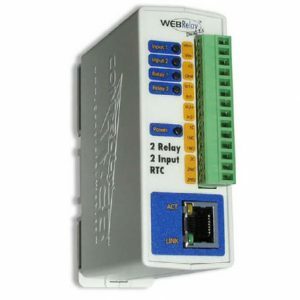 It has 16 relays, 16 optically-isolated digital inputs, 2 counter inputs, 4 analog inputs, support for up to four temperature and/or humidity sensors, and the ability to control relays remotely on other ControlByWeb devices. It also has many additional features such as a full calendar scheduler, a BASIC script interpreter, logging, and a real-time clock with NTP synchronization. 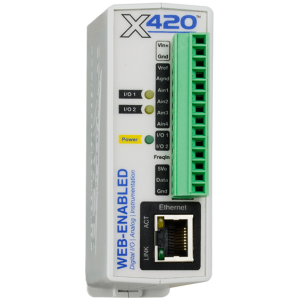 The X-332™ has a built-in web server so its relays and inputs can be controlled and monitored using a standard web browser (or by using our CBW Mobile smartphone app). Additionally, temperature and humidity data can be graphed directly from any HTML5 compatible web browser. Email alerts can be configured based on relay and/or input states, and temperature/humidity thresholds. Some of its many advanced features include the ability to initiate a connection to remote servers, BASIC programming, SNMP, peer-to-peer communications, internal monitoring, etc. This module is ideal for many applications including security, lighting control, remote control, shift bell controllers, and much more. 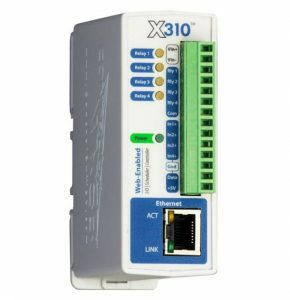 Simply access and configure the X-332™ by using its web-based user interface. There is no software required, no subscription to buy, and no programming necessary for setup or use.